While others’ views of Dawn are very much altered by this sudden revelation, they are not changed nearly as drastically as Dawn’s view of herself. Realizing that she has an important role to play in unfolding events, realizing that she has a power few others have (and with that power, a responsibility to use it to help those in need), she acts in ways she never would have done before. Dawn secretly sneaks away from her house, and assists a girl she meets, Amanda, in going after a vampire. Instead of going back for help, as she would have done before, Dawn takes charge of the situation, going back to the scene of the attack with Amanda and seeking out the dangerous vampire alone. Foucault explains this sudden change in behavior from helpless to hero best when he said, “Power…makes individuals subjects. There are two meanings of the word “subject”: subject to someone else by control and dependence; and tied to his own identity by a conscience or self-knowledge” (Foucault). Dawn certainly feels tied to this new self-knowledge, modifying her behavior to fit how she believes a “Slayer” should act. When she encounters a shaken Amanda on the street, she proceeds to question her in a business-like manner, asking several questions in rapid secession before assuring Amanda that everything is going to be alright (“Potential”). Amanda thinks this means they are going to get Buffy, stuttering out that she’s heard that “maybe she could help with this kind of thing. Do you think we should go get her?” Dawn haughtily replies “She’s out. I’ll take this one” (“Potential”), very literally stepping into her sister’s place and, with the knowledge of her Potential status, taking her sister’s power as her own. Even so, Knowledge is not always Truth. On occasion knowledge is as much faith as anything else. Scholars once emphatically ‘knew’ that the Sun revolved around the Earth – but this was not the absolute ‘truth’. This knowledge gave these scholars a certain power, a feeling of control over the workings of the universe. Yet as the knowledge was false, so the power was weak. What occurs when ‘true’ knowledge comes into the hands of the individual? 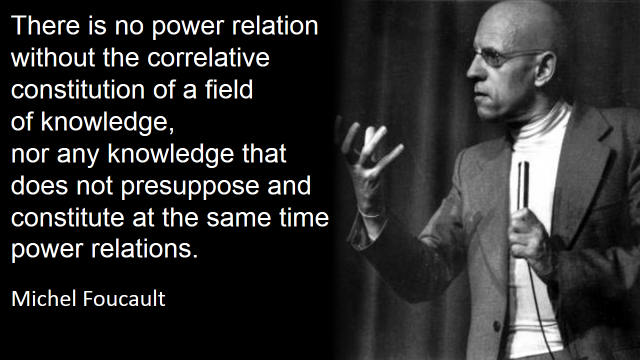 It stands to reason, by Foucault’s premise of power/knowledge that with ‘true’ reason comes a ‘true’ or ‘ultimate’ power. At the end of this episode, Foucault’s theories are taken a step beyond what he may have intended, interpreting them in a new and unique way. 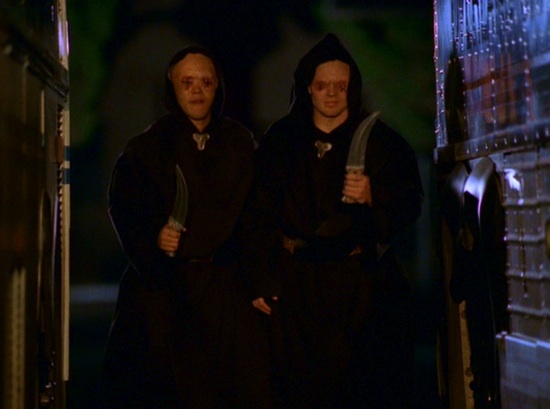 While Dawn is struggling with the vampire, ‘The First’ makes it move to destroy Sunnydale’s potential slayer – Amanda. ‘The First’ uses its minions (‘the Bringers’) to grab Amanda, as Dawn shouts, “No! You don’t want her!” (“Potential”). ‘The Bringers’ continue to pull at Amanda violently, as Dawn slowly begins to realize what has happened. “You want me…” she whispers, but even as she says it she knows that it is not the truth – Dawn is not a Potential (“Potential”). It is later revealed that the spell had merely passed through Dawn to get to Amanda. In the wake of this realization, Dawn jumps to her feet, beating away ‘the Bringers’, speaking to Amanda as they run. “Amanda, listen to me! Remember when you said I was special? Well, I’m not. But the thing is, you are. This is your battle, Amanda…I’ve got your back, but this is something you have to do. It’s something you were born to do.” ‘The Bringers’ catch up with them, but not before Dawn hands over the broken flagpole she was using as a weapon to Amanda, saying, “Here, this belongs to you.” Amanda does manage to fight off ‘the Bringers’ as well as stake the vampire Dawn had been struggling against. “The minute you found out you weren’t [special], you handed the crown to Amanda…You gave her your power. They’ll never know how tough it is, Dawnie, to be the one who isn’t chosen. But I know. I see more than anybody realizes because nobody’s watching me. I saw you last night. You’re not special. You’re extraordinary” (“Potential”). Dawn and Xander share a special sort of power, a power that normal, hard-working people everywhere share, maybe without even realizing it. They have the simple, invaluable power of knowing themselves. They may not be heroes, not the kind that people put in the newspaper or hang up posters with their pictures on their walls. But they can live quietly, proud with the power of knowing who they are, who others are, and what it all means. Foucault, Michel. “The Subject and Power.” Critical Inquiry 8 (1982): 777-95. Jstor. Suzzallo Library, Seattle. 19 May 2009 . Kirshner, Rebecca R. “Potential.” Buffy the Vampire Slayer. FOX. New York, NY. 21 Jan. 2003. This entry was posted in Academic and tagged Academic, Arts, Buffy the Vampire Slayer, Creative, Dawn, Dawn Summers, Essay, Gaze, Joss Whedon, Literary, Michel Foucault, Non-Fiction, Philosophy, Robin Jeffrey, Television, TV, Writing. Bookmark the permalink.